High and Variable Rates of Blood Flow Have Very Positive Consequences on Arterial Health and Atherosclerosis. If blood flows slowly and gently through arteries and veins, several things happen, and none of them are good. First of all, due to the extensive branching that goes on with the arteries and veins, there will be areas of slow flow, or even no flow. You will se the same effect in a meandering stream, there will be little pockets where the water hardly moves. It is in these zones that that the water will gather algae and become slimy, and an analogous situation occurs in these critical spots in the arteries. Of course, it isn’t algae that is collecting at the slow-flow spots, but rather various circulating toxins such as free radicals or oxidized cholesterol. They will stick to the endothelium. 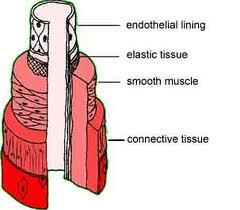 The endothelium is a very thin layer of very slippery cells that line the inner walls of arteries and veins. If enough detritus collects on these cells, they can damage or even kill the cells. This is bad news. A dead cell is a leaky cell, and just about anything that is circulating now has a chance to get behind the cell wall. A buildup of such rubbish is the beginning of atherosclerosis, and indeed, most such problems start in regions of slow or erratic flow. If endothelial cells are clean, they will last a long time. These cells don’t regularly turn over like skin cells. At any given time, perhaps 3,000 endothelial cells will be undergoing replacement. This is a very small percentage of the 10 trillion such cells a person typically has, but a dead cell is a leaky cell, so several mechanisms spring into action to seal off the leak. First platelets will completely cover the dead cell. This greatly reduces the flow, blocking all but the smaller cholesterol particles, for instance. This happens almost immediately. Second, a replacement cell is stitched into place. Even though endothelial cells can replicate, this apparently isn’t fast enough; there is a supply of replacement cells in circulation. One of these will be drawn to the area and form a perfect replacement. Crisis over, but during the repair operation, some stuff got behind the cells and is still there. There are two lines of defense here. And both are optimized by the proper sort of exercise and diet. First, during the repair process, the platelets form a leaky mesh. Smaller cholesterol particles get through, and these are major contributors to atherosclerosis. The cholesterol size is mainly diet driven. Keeping triglycerides down (ideally below 100 mg/dl) will cause the particle size to be large, and relatively harmless. Most people with high triglycerides can easily reduce them to safe level by cutting out enough alcohol, starches and sugars. How much is enough? This can be determined by blood tests. Just cut till triglycerides are low enough. Or cut starches and sugars out entirely; maybe even all alcohol. Most of us need neither. There are posts on the benefits of lowering triglycerides here and here. The second line of defense is to scrub the arteries. Hosing them down might be a better description. Let us take a peek inside someone who is engaging in high intensity exercise. This sort of exercise rapidly runs the heart up and down to a safe maximum. Before the exercise, red and white cells are drifting by. Suddenly the exercise begins; perhaps a 30 second sprint at maximum speed up a hill. Interval exercise doesn’t last long. No one can maintain that intensity for more than a few minutes. A couple of minutes later things are back to normal. Not really. Those brief episodes of arterial chaos left an aftermath, and a very beneficial one. The scene is transformed. The environment is pristine and clean. The shear force of the rushing, pulsing blood gave the endothelium a thorough hosing off. Any stuck gunk is washed away. Several very desirable key endothelial cell functions were also triggered by the shear force, and, of course, blood will now flow more easily and uniformly. This arterial cleaning may be the most important benefit of exercise, though it would be competing with dozens of others. Someone who keeps their triglycerides under control, thereby preventing the dangerous smaller LDL cholesterol particles, and who exercises in such a way that the endothelium, the interior artery wall, is scrubbed down periodically, is probably never going to get atherosclerosis. Further, if atherosclerosis is already present, this will start reversing the disease. What Is A Safe Heart Rate Maximum? For people with no known heart issues, this usually is the maximum they can achieve. However, anyone deciding to run their heart up and down should consult their physician. But, if the physician recommends restraint, make him or her justify this, as the benefits as described above are profound. 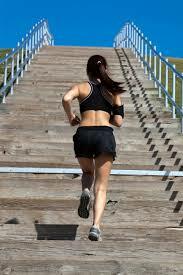 Short bursts of exercise like sprints are kinder on the joints than longer jogs. It is not just the arteries that benefit from increased short term blood flow. Various vital organs do too. Blood vessel elasticity improves with short intense bursts. Just don’t overdo it. You could pull a hamstring! I love your two books: Quantitative Medicine and Eat Real Food or Else. I have completely cut out sugar, starches, and alcohol, and have been doing slow-motion strength training twice per week and have begun adding in low intensity interval training several times per week. I have lost 17 pounds since December and have never felt or looked better! My question for you is this … in your book, Quantitative Medicine, you briefly mention that those unfortunate people who have an APO-E4 or a high lipoprotein “a” level might have to adjust your recommendations. Well, I have BOTH of these. There is a history of heart disease in my family … my mother, grandmother, and several uncles all had massive strokes but not until they were in their 80s. I am 57 years old. Can you tell me if your recommendations regarding eating a high fat diet still apply? Yes, you have to eat good butter (made with grass-fed cow milk) and sour cream. Your brain need them badly! Coconut oil, red palm oil, olive oil and clarified butter are very good for your health and stamina. Try, you will feel the difference! That was prooved by the (former) Soviet medical science which used to be not limited / defined by money or greed.